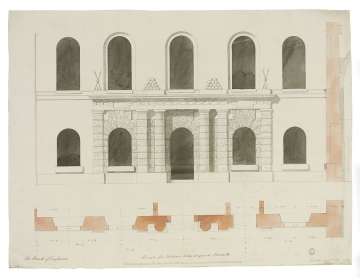 In drawings 10 and 11, the north entrance to the Bank consists of three rusticated bays at ground floor level. Drawing 10 shows two doors with a projection in between that is framed by twin attached columns. 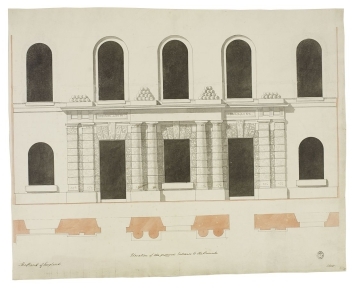 Drawing 11 shows a door in the middle bay, framed by attached rusticated columns and between windows and rusticated pilasters. The three bays in drawing 11 together support a full Doric entablature with pyramids of cannon-balls and (in drawing 11) crossed spears.